The 14th Annual Faculty Technology Receptions (Umbrella) took place on October 10 and 11, 2018, from 2:30 to 4:30 P.M., in Room 122 of the Regenstein Library. 141 faculty and staff, representing every division and professional school of the University, attended the event. 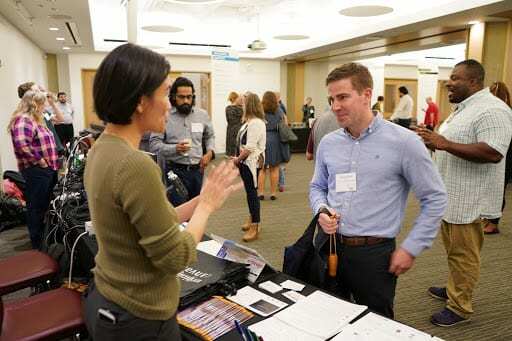 Over 49 volunteers from 11 different campus organizations were on hand to speak with attendees about the role that technology can play in supporting research, teaching, and learning at the University. As in past years, wine, fruit, and a wide variety of cheeses were available for all to enjoy. 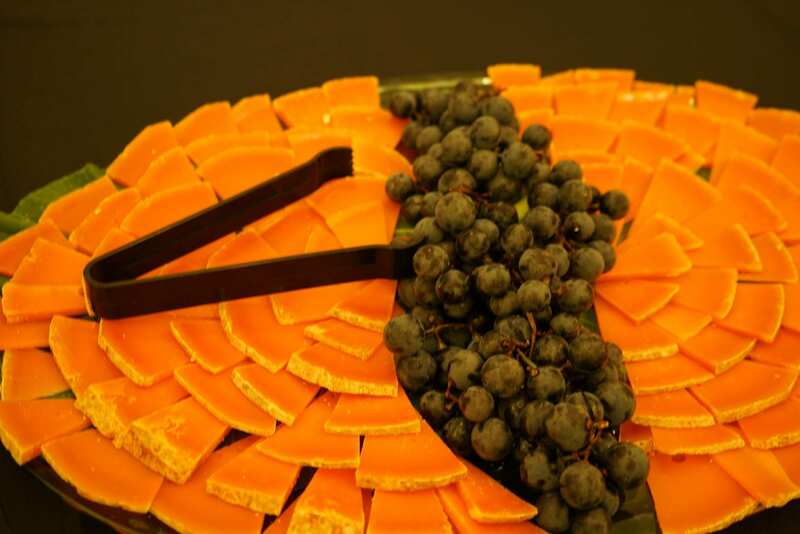 A spread of fruit and cheese at the Faculty Technology Receptions. Faculty and staff met with Academic Technology Solutions instructional designers and audio-visual technology specialists to ask questions and get advice on many different topics concerning the intersection of teaching and technology, from how to organize a Canvas course site to installing multimedia equipment in classrooms. Many faculty expressed interest in reaching beyond the basics of Canvas and finding ways to use its more advanced features or integrate it with other learning tools. ATS answered questions on Canvas’ built-in moderated grading function; creating course blogs on the University’s Voices platform, which can be integrated with Canvas sites; and creating multimedia, such as animations and 3-D visualizations, to enhance instruction. ATS instructional designer Cecilia Lo talks with faculty member David Miller (Physics). ATS instructional designer Mohammad Ahmed (right) demonstrates Poll Everywhere to Field Museum curator Richard Ree. Faculty were excited by the opportunities that the new OneButton Studio affords them. ATS gave tours of the facility on both days, and these tours were extremely well-attended. The studio is an easy-to-use video and audio recording facility, available to faculty and students alike; it makes recording as simple as inserting a flash drive and pressing a button. A number of faculty expressed interest in using the OneButton Studio, whether to record video for their classes or to give multimedia assignments that their students could use the studio to complete. The new OneButton Studio on the A Level of the Regenstein Library, viewed from inside. Along with ATS, many other University departments and organizations took part in the event and answered questions for faculty and staff on every aspect of computing and information technology. These organizations included the Chicago Center for Teaching; UChicago Voices; the Research Computing Center, which supports research and high-performance computing throughout the University; the Visual Resources Center, which supplies high-quality digital images for teaching and research in the Department of Art History and other Humanities departments; and the UChicago Library’s newly established Center for Digital Scholarship. Bridget Madden (right foreground) of the Visual Resources Center speaks with attendees. 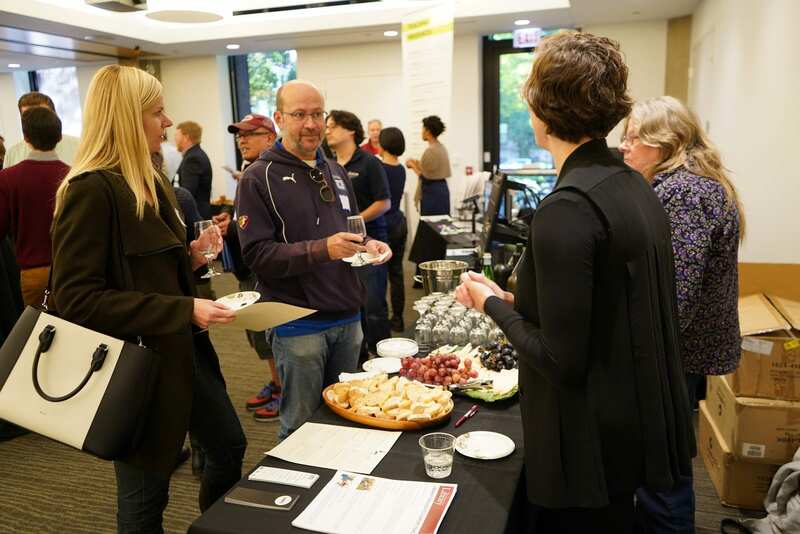 The event as a whole was held under the auspices of the Umbrella Initiative, founded in 2004 to coordinate the many technology organizations on the UChicago campus and help make faculty aware of the technological resources available to them. Appropriately enough, colorful umbrellas were given to all attendees. The festivities concluded on both days with drawings for door prizes. 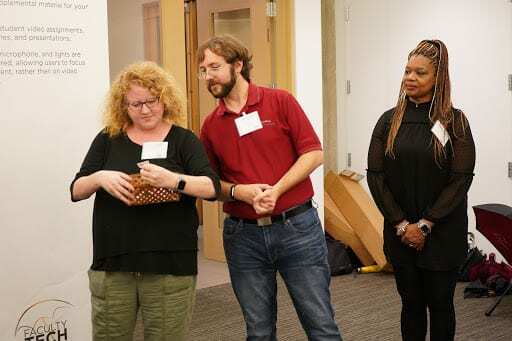 Members of the Faculty Technology Receptions planning committee (left to right: Astrid Fingerhut, Jason Edelstein, and Cheryl Walker) hold a drawing for door prizes. 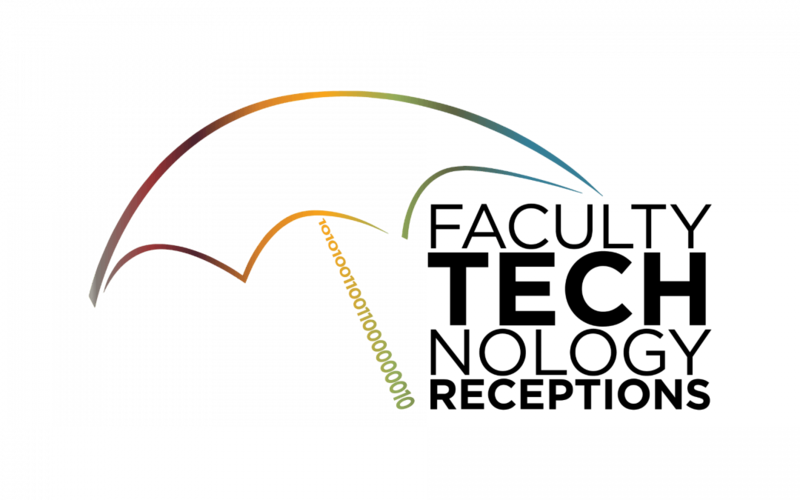 ATS and the Umbrella Initiative would like to thank everyone who volunteered at or attended the event. Thanks to you, the 14th Annual Faculty Technology Receptions were a resounding success.